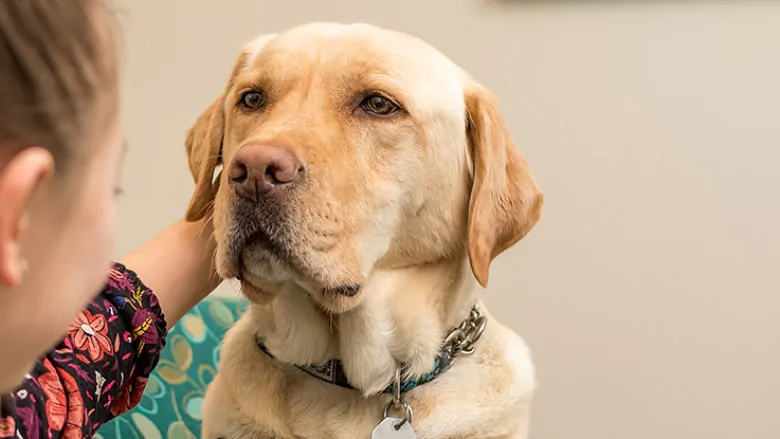 For what is believed to be the first time in Nova Scotia’s provincial court system, permission has been granted for a support dog to accompany a child who will testify during an upcoming sexual assault trial. The trial will happen in June in Bridgewater. The child’s age and details surrounding the case have not been released. The dog involved is Dorado, a yellow lab who is known as an accredited facility dog. He works at the IWK Health Centre with Angela Arra, a clinical nurse specialist on the Halifax hospital’s Suspected Trauma & Abuse Response Team (START). Arra spoke to CBC Mainstreet host Preston Mulligan. This interview has been edited for length and clarity. Does the job keep him busy? He is busy. He works what we call a point seven, so he works seven out of 10 days and Mondays are always his day off. Dorado has provided support to over 200 children in the year and a bit he’s been working with us, and has sat in on over 70 forensic interviews where he’s provided that support during the interview process. How did Dorado end up at the IWK? He made his journey from B.C. about a year and a bit ago. We put an application in to his home school, which is PADS — Pacific Assistance Dog Society — and they matched us with Dorado. What kind of training does he have? These dogs start their training when they’re about four or five days old. With early stimulation to help them become accustomed to loud noises, different textures, different amounts of stress — so they have a higher capability to manage stressful situations than other dogs. Then he would go through basic obedience and then what we call advanced training where they start learning extra skills that would help them help others in public. So being able to avoid becoming stressed out or becoming distracted when they see a bicycle or a squirrel, being able to provide body pressure or some grounding therapy to help someone kind of centre themselves when they’re anxious. Tell me about this business with cortisol, what that is, how we all kind of emit it, and Dorado is kind of an expert in sensing and smelling that. Cortisol is the hormone that’s released when you start to get stressed out and you usually feel it when it’s already being released and that triggers your fight, flight or freeze mode. What Dorado does is he can smell the cortisol being released from you before you even know, before you register in your brain that you’re stressed out. So he will intuitively come to you and then use the skills that he’s been taught to help people calm or to ground them. He would be to either provide some body pressure by leaning up against you or placing his chin on your leg and making his head very, very heavy, which grounds you, brings you back to the present and then allows you to realize, OK, I’m in a safe place I’m in a comfortable space. And then you will start to release your happy hormones — so your oxytocin and your serotonin — to help level you back out. When he’s working he is laser focused. Some of the tests that they have to pass to be able to ignore anything that may be dropped around them, so if it’s a big bang or it’s a plate of bacon that falls on the floor, he wouldn’t give it a second thought because his focus is on me or the person he’s helping to be so calm. Once he’s released and his vest has taken off and he’s in regular Dorado time then he’s a goofy lab who likes to run and play. How do the children respond to him? The children, I think it’s safe to say, they absolutely adore him. Before kids come in, we do check out with their caregivers or whoever is bringing them whether or not there are any allergies or fears to dogs. And we’ve had some kids who said they were afraid of dogs so they just looked at him through the door and then next thing you know they want him in playing. He has a mailbox and kids can write him letters, and he does respond to letters if he has an address. What must be done in order to get permission from the court for Dorado to attend? In court cases for vulnerable witnesses you can request testimonial aides, and those testimonial aides can be things like a screen placed in front of you so you don’t have to see the person you’re testifying against, or testifying from a closed-circuit TV room so you don’t even have to be in the courtroom. So the Crown — who felt that this connection that this client had with Dorado was so important to support her to be able to give her best testimony — that she filed an application under their acts, and we put together a CV for Dorado that is eight pages long and outlines all his skills and training. So they have a relationship, Dorado and this child, already? Yes. And the practice across Canada and across the U.S. is that with facility dogs that are accompanying witnesses to court that there is a pre-existing relationship. So that has to be kind of proven that the dog and the witness have a connection and that that support is already proven. Does he ever surprise you with his insights into who is most stressed in a room? He’s brilliant. He always knows — his nose knows. Do you think you’ll be doing more work in court? I would love to say yes but the demand … it’s just beyond what we can provide. However, there is a small group of us who work together with public prosecution services, Department of Justice, victim services, court services — who are trying to expand the program into the community. It’s really heartbreaking that a service like this is required and that his skills are required. But at the same time must be very rewarding to see how he can help children? It is. I mean the things that he is helping people through are the worst things a child in a family could ever go through. And I think working with our team, being such a collaborative inter-professional group, that we’re able to support ourselves and support Dorado to do his work. And when the kids and the families walk out the door at the end of the day and they’re smiling and waving after having disclosed horrible, horrible events it makes my heart very happy.